What the F Happened?December 2013 - What the F Happened? Getting to the root of the Duck Dynasty controversy! Unless you’ve been in a coma or have been sleeping under a rock without service to a cellular telephone, by now, you have heard of the ‘latest’ political-correctness debacle. 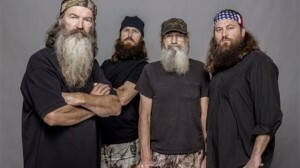 A&E suspended Phil Roberston from the #1 Reality Show in America – the Duck Dynasty! Duck Dynasty is an American reality television series on A&E. It shows the lives of the Robertson family, who became wealthy from their family-operated business, Duck Commander, operated in West Monroe, Louisiana, which makes products for duck hunters, primarily the duck call named Duck Commander. The Robertson men, brothers Phil, Si, and Phil’s sons Jase, Willie, and Jep, are known for their long beards and their religious views. The business began in a family shed, where Phil Robertson spent 25 years making duck calls from Louisiana cedar trees His son Willie is now the CEO of the company. The family was previously featured on the series Benelli Presents Duck Commander and its spin-off Buck Commander, which still airs on the Outdoor Channel. The show has broken several ratings records on both A&E and cable television as a whole. The fourth season premiere drew 11.8 million viewers; the most-watched nonfiction cable telecast in history. On December 18, 2013, A&E announced that it was suspending Phil Robertson from the show indefinitely. The characters are playing themselves. Phil is the father; (Philip Alexander Robertson) created the Duck Commander duck call in 1972 and incorporated the Duck Commander Company in 1973. Kay Robertson (Marsha Kay Robertson, née Carroway), Phil’s wife, is most often referred to as Miss Kay. She married Phil at age 16. She is the mother of Alan, Jase, Willie, and Jep. She loves cooking and often has her entire family over for a home-cooked meal after a hard day’s work. The father (Phil Robertson) was being interviewed by GQ Magazine for an ‘entertainment’ report to be featured in January, 2014. During that GQ interview, the question was asked about personal views on political and social issues that led to remarks Phil Robertson said about homosexuals and racist remarks in general. The interview had nothing to do with A&E. And I would make a cheese cake and give it to anyone that could prove whether the A&E contract dictates what can be said or done outside of A&E. It is obvious that the Duck Family (Robertson Family) believed a certain way about issues long before A&E glamorized their already build duck calling business. Its like the person that pick the snake up off the road and took it home to nurse it back to life after it had bee run over by a car. Immediately after the recovery, the snake bites the person and she gets mad because after all she did to bring it back to life, the snake bites her is hard to accept. Well, you knew it was a snake when you took it home to nurse it. Snakes bites! That is what they do. Can a leopard change its spots? Rednecks are folksy and they are conservative. Black folk are also folksy…we have let our political-correctness deface the morals and values that were instilled in us by our conservative Bible packing Black parents. Trust me; this is not going to create the same ugly domino effect caused by the Paula Dean haters when her sons stayed on their show while their mother lost almost everything. There will be nothing to boycott because the Family refuses to do the show without their father; and like it or not, that is exactly the way it should be. Families should stick together. I did read a piece earlier today that reported that over a 100,000 digital signatures had been collected for Americans to boycott A&E. Um, I wonder how that is going to feel in a few weeks. There are still more conservatives than liberals and they all stick together. Wal-Mart will not remove the Duck Dynasty products from their shelves. Did Dan T. Cathy the President of Chick-Fil-A lose business because he took a stand against samesex marriage? The fast-food chicken establishment still closes on Sunday’s to allow their employees in all 1700+ locations in almost 39 states to go to church (if they chose) and the be with their family (if they chose). And what’s wrong with that? Ask yourself this question. What would the USA Cable Network channel do if one of the members of its show “Modern Family” made irate, racial, or derogatory remarks again Blacks (African Americans), Christians, Jews, or Muslims? Would you call for a boycott? Would you protest the person making the comment? Should the network channel suspend the actor from the show because they spoke on a topic that they were passionate about? That being the case, should I be able to share my opinion on this matter with the world through the use of this blog? Take note: The Robertson’s (Duck Family) were financially well off before A&E. A&E needed the Duck Dynasty. Watch this one closely. This issue could change the White House. Oh, and before I let you go, try this one. I heard a Christian Group canceled the participation of the Duck Dynasty from their event because the Duck Family announced they had partnered with a wine company to make and sell wine. The Christian Groups claimed this business goes against their values and morals. Do you see what I mean about political-correctness has run-a-muck? Did these so-called Christians read John Chapter 2 in THEIR Bibles? This is why we need to be very careful. Very Careful indeed. I support Phil Robertson. I support his family for supporting their father. And I support those 100K plus people that signed the petition to boycott A&E; one of those signatures is mine. This channel will not get any air-time from me.